Despite its growing reputation as one of the stronger economies of South Asia, the image of Sri Lankan labour may be at risk following a thirty-year civil conflict, alternative spending priorities and growing institutional imperfections. Labour market reforms and private sector action is required to help Sri Lanka escape the paradox of slow growth and labour scarcity, Ganeshan Wignaraja writes. In The World Bank’s Sri Lanka Development Update Report 2018 on creating more and better jobs for an upper middle-income Sri Lanka. The theme chapter usefully analyses the state of Sri Lanka’s labour market and identifies various challenges to attaining this development goal such as youth unemployment, education quality and gender discrimination. The report’s deep dive on women’s labour force participation in Sri Lanka generally and in post-conflict areas is thought provoking. The usual World Bank macroeconomic narrative about the link between slow growth and lacklustre implementation of economic reforms in a complex political environment is also discussed. In my view, Sri Lanka appears to be an outlier in a typical Arthur Lewis model story of surplus labour moving from the low productivity rural sector to drive the expansion of a high productivity modern sector. Sri Lanka currently has a paradoxical combination of slow growth (an annual average rate of 3.9% during 2016-2017) and labour scarcity (a low annual average unemployment rate of 4.3% during 2016-2017). The co-existence of a bloated public sector alongside a labour starved private sector defines the modern sector. While Sri Lanka’s growth is being shackled by adverse weather affecting the rural sector and rising oil prices, the labour market deserves special attention. The time seems ripe for a few, well implemented measures to increase labour market flexibility and boost growth. The private sector has to up its game too. Four kinds of labour market issues merit serious discussion in Sri Lanka. First, the World Bank report rightly identifies raising female participation rates to increase labour supply amidst Sri Lanka’s transition to an ageing population. Japan is trying to increase female participation rates as a part of the so-called “Abenomics” structural reforms. A key lesson coming is that providing affordable child care such as subsidised nurseries in large private firms and community-run creches at village-level really encourages mothers to return to work. The best Sri Lankan firms should unilaterally set the example and others are likely to follow. Another is ending harassment of women at the workplace and transport through a “#MeToo” social media movement and compulsory workplace training in both the private and public sectors. These measures are crucial outside Colombo and in post-conflict areas where women headed households dominate the labour force. Second, a missing issue in the World Bank report is poor English language skills of workers which hampers labour productivity and exports of IT services. This meant that when wages rose in Bangalore’s global IT hub a decade ago, Indian firms did not come to neighbouring Sri Lanka partly due to a scarcity of English speaking graduates and political uncertainty. Instead Indian IT firms went to the Philippines to set up shop. The language problem is compounded by a lack of competent English teachers in Sri Lanka. A radical solution from China is to import low cost competent English teachers from the Philippines on short-term work visas under a technical cooperation arrangement. A similar scheme may be developed for bring in Chinese teachers given a growing Chinese investor presence in Sri Lanka and a dearth of Chinese speaking local workers and managers. 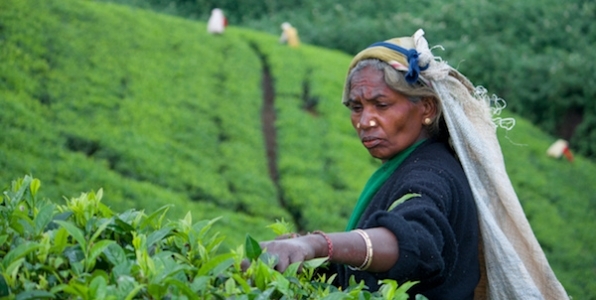 A woman working on a tea plantation in Sri Lanka’s Hill Country. Photo credit: Dhammika Heenpella, Flickr, CC BY NC 2.0. Third, the skill mismatch of ample art graduates and employability in the private sector is discussed in the World Bank report. The default for graduates is low productivity public sector jobs. This is a poor return on costly tertiary-level educational investment and a source of social distress including youth insurrections in Southern Sri Lanka. South Korea and Singapore offer valuable insights. As a part of recruitment efforts on university campuses, business in Sri Lanka should offer paid internships to provide a taste of a competitive work environment. Making holiday internships compulsory in degree courses and properly resourcing university careers services can help too. Furthermore, charging even modest fees for university education sharpens young minds on job market prospects. And it might reduce incentives for anti-social behaviour like raging and unjustified student protests. One such example being the recent politically motivated protests in Colombo against the opening up of the state education sector to the entry of private medical education providers. Finally, the cost of a bloated public sector – accounting for some 17% of employment – gets scant mention in the World Bank report. This has contributed to an unsustainable fiscal burden amidst a historically high debt to GDP ratio of about 77%. The recent human resource reform to make heads of government entities responsible for paying salaries of excess employees is a useful step. A radical end game is creating a leaner, more efficient public sector in Sri Lanka. The New Zealand example of trimming the public sector offers insights. The reforms included a national public-sector employment audit, a redundancy/retraining scheme, lateral entry from outside and introducing new technologies. Salaries were also raised for remaining civil servants providing incentives for improved productivity. Decades of providing free education and health along with food subsidies gave Sri Lanka a reputation among developing countries for being a basic needs success story with ample supplies of cheap and literate labour. This helped to attract export-oriented foreign investment into the clothing industry and created around 900,000 jobs after Sri Lanka opened up in 1977. But the reputation of Sri Lankan labour may be at risk following a thirty-year civil conflict, alternative spending priorities and growing institutional imperfections. Combing labour market reforms with private sector action can help Sri Lanka to escape from the paradox of slow growth and labour scarcity.